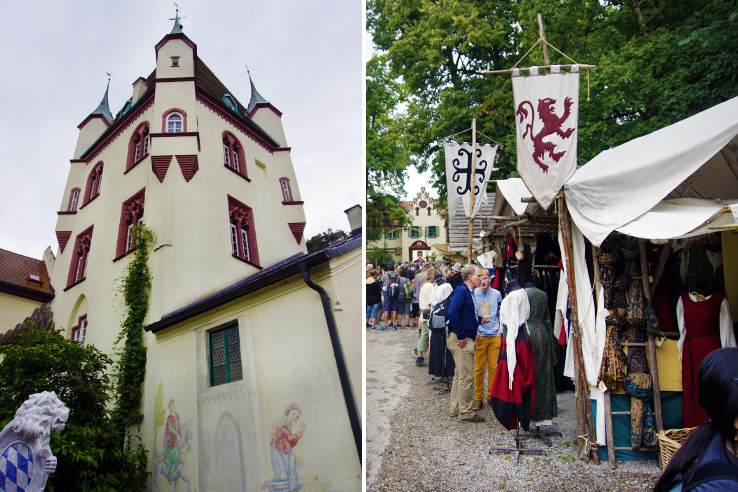 Kaltenberger Ritterturnier: A festival filled with the best food, the best crafts and the largest jousting tournament in the WORLD. 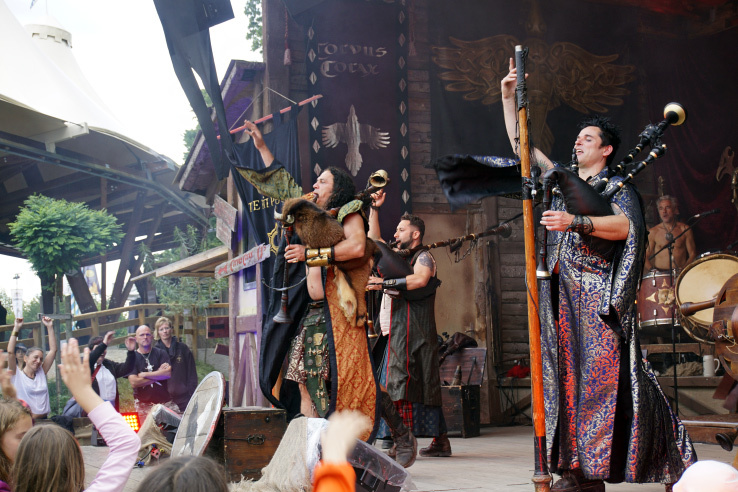 Renaissance fairs have always been a favorite of ours. 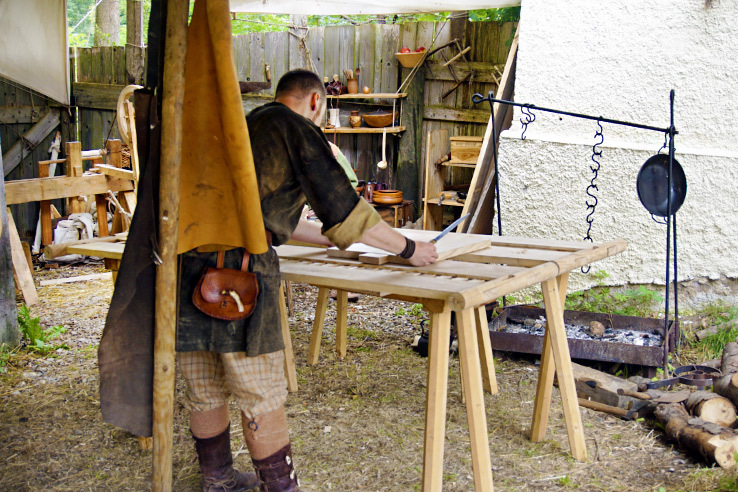 Husband Erin attended the Pennsylvania Renaissance Faire since he was just a little boy, and brought the tradition into our relationship when we lived in the USA. Quickly, I too realized there’s nothing more fun than stepping back in time to enjoy life in the Medieval period. 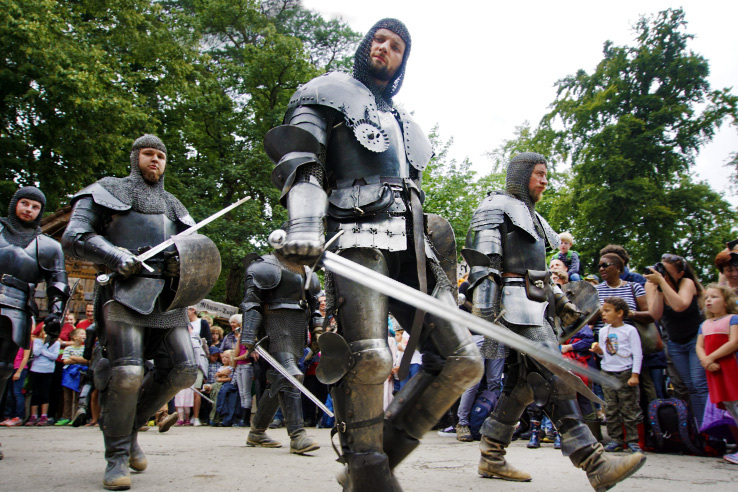 Whether you dress up as a knight and go full out Renaissance. 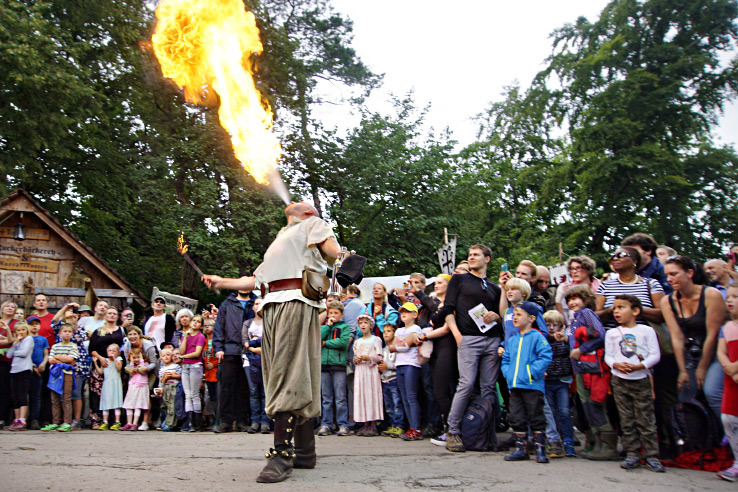 Or just go for the shows, crafts, ale and overall experience. It’s a guaranteed fun day of imagination and entertainment. 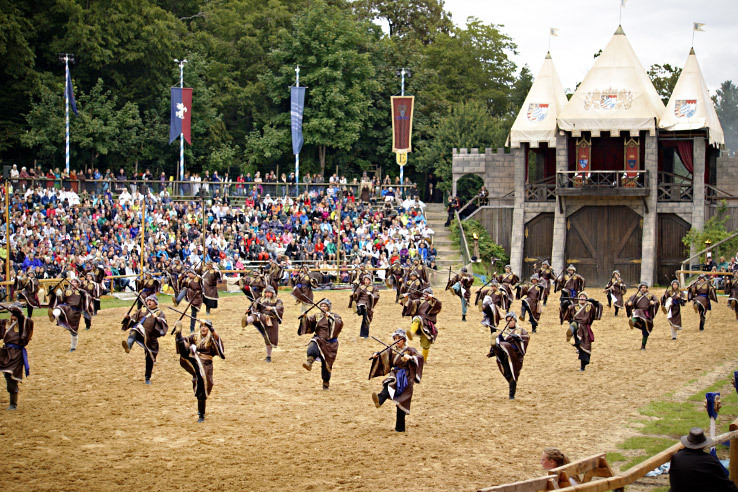 Which is why we HAD to experience a Renaissance Fair in Europe, where the Renaissance actually existed. And at a REAL Bavarian Castle – Schloss Kaltenberg. Our expectations were high. And not only did the festival meet those expectations, it surpassed them in ways we NEVER thought possible. We woke up casually since the festival didn’t open until 11 am, packed up for the day (preparing for the rain in the forecast) and headed out. Our Airbnb was about a 20-minute drive to the festivities, making our journey easy and foolproof, just as we planned. Time traveling back to Medieval times. Right when we pulled into the parking lot, our excitement reached new levels! We noticed immediately that people were also dressed up in costume– just like they do back home! I didn’t expect to feel as excited as I did. 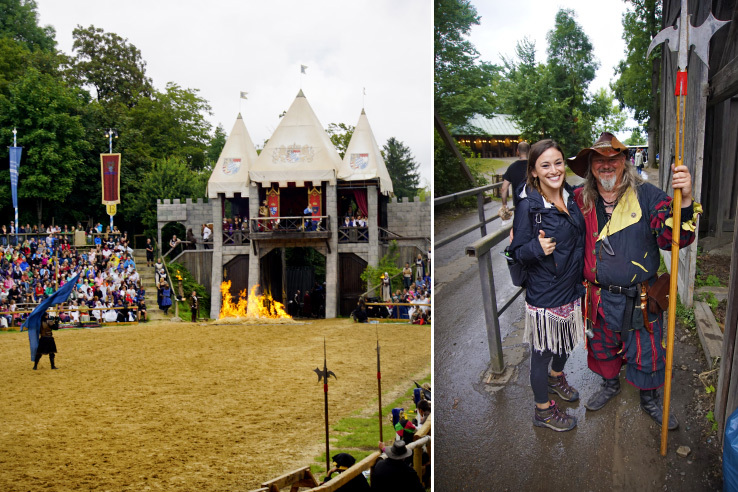 Erin’s always been the one obsessed with the Renaissance Fair (I really think he was a knight in another lifetime), but I also couldn’t contain myself! Maybe it’s because the medieval world actually existed here in Germany, whereas back home, it’s just show put on to appear like the medieval world (pretty accurately, I might add). THIS felt like real life. Like we were literally stepping back in time. We picked up our tickets at the counter and headed on in. 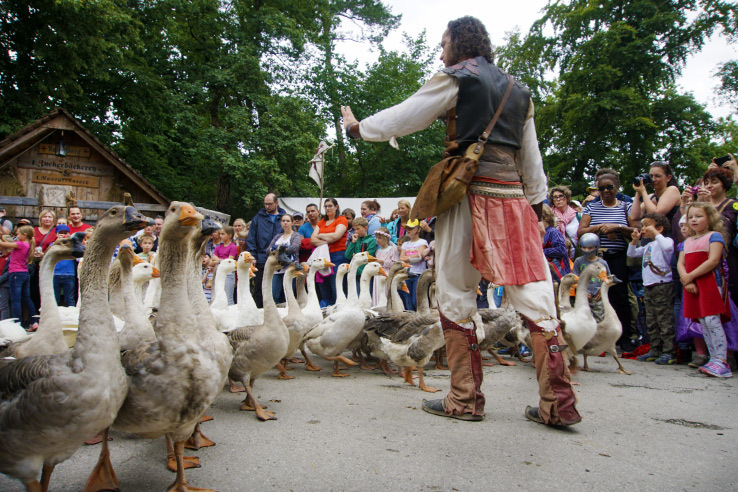 Right away, we were greeted by a parade of geese and an enchanted forest – YES! 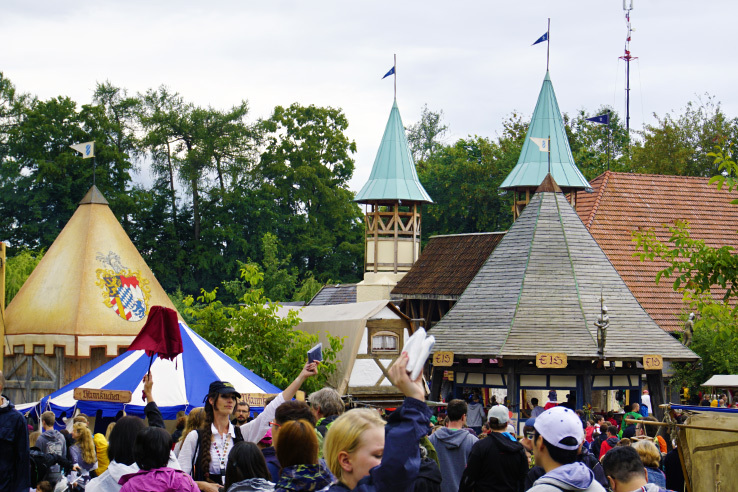 The forest was filled with authentic craft vendors, selling such unique pieces and tents. 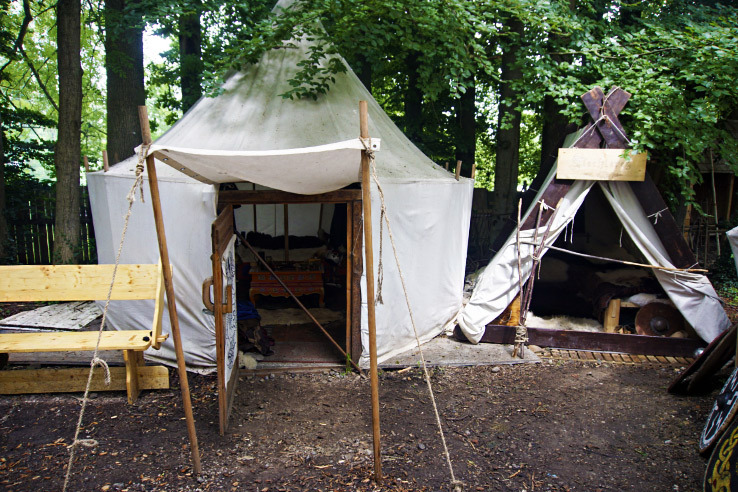 We looked around, already wowed by the potential purchases and walked into our first tent. The crafts were extremely authentic and creative. The vendors selling cheesy fake products were few and far between, which is not usually the case. Most were even made live by craftspeople at the show! 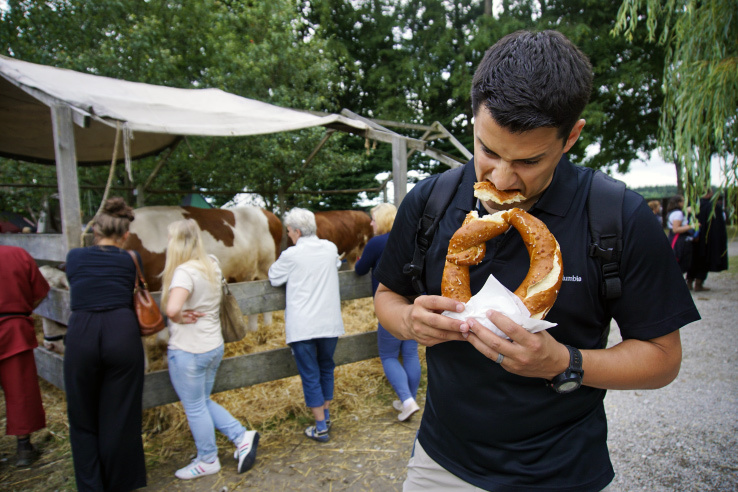 The smell of everything delicious fills the air at Kaltenberger, everywhere you turn. 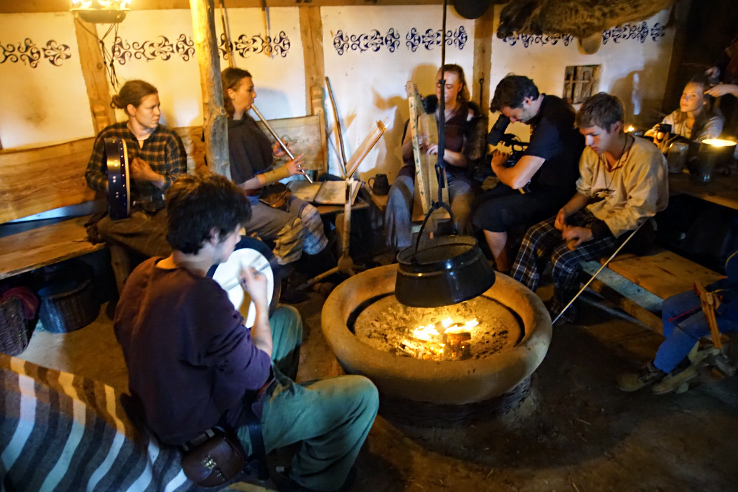 Meats, freshly baked bread being pulled out of the oven, soups, mushrooms sautéing over an open fire. We were overwhelmed (in the best way possible) by it all. Our senses were running wild! All the German classics aka the taste of happiness. Best part? All the food was affordable too. We started off with a crepe and fresh berries (which substituted for our lack of breakfast) and then proceeded to chow down on everything that caught our eye. No holding back. The bread was the best part, though. 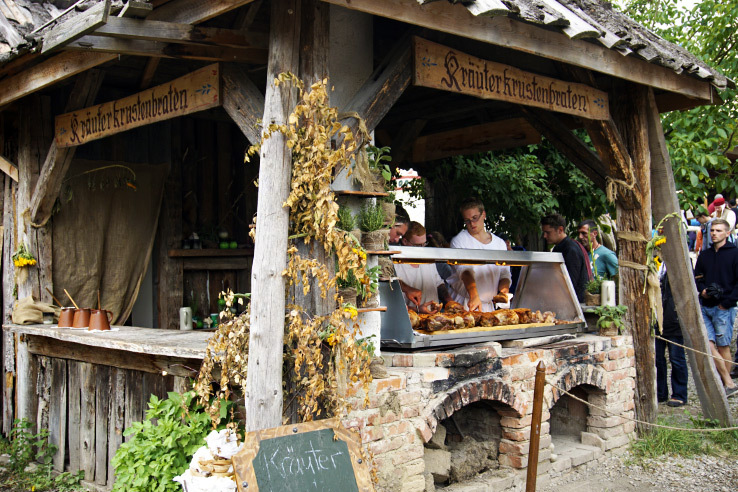 We’ve never had bread like this before – not even in Austria! It was a dark and crusty, but soft and moist on the inside. Melt in your mouth kinda bread. And after circling the entire festival grounds, we had to go to one specific food stand more than once. 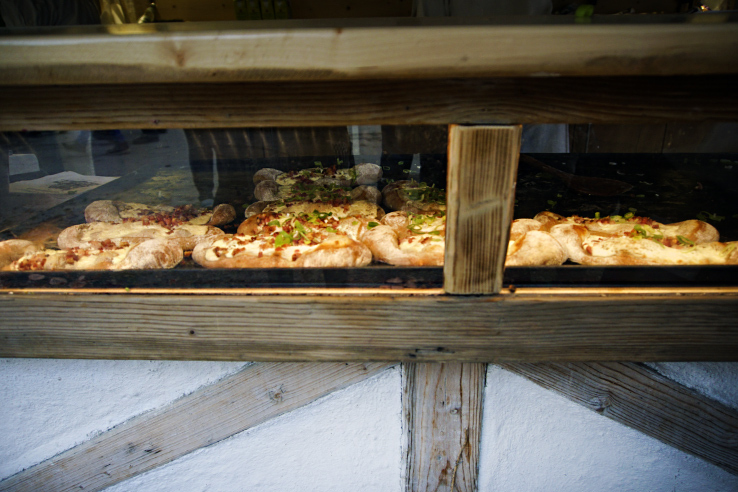 The stand that served fire-cooked bread with cheese, bacon, and scallions. Pulled out of the oven and placed directly in a napkin, in your hands. Too hot and too fresh to devour immediately. 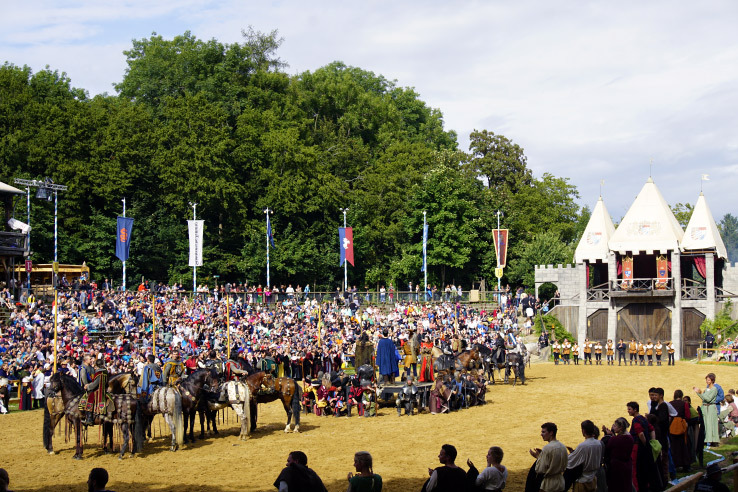 A Medieval Parade, to be exact. At 1:30 pm, the parade commenced! We found front row seats, took our Kase Spaetzle (Austrian/German mac & cheese) and sat down on the parade route, ready to take it all in. 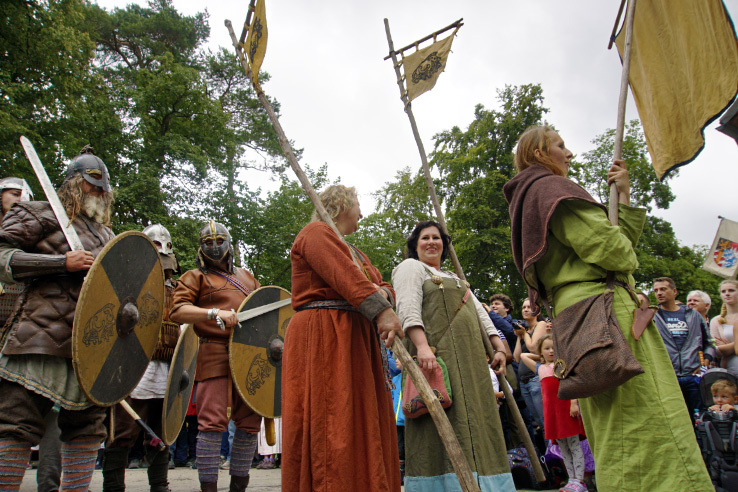 The medieval parade was a serious show! 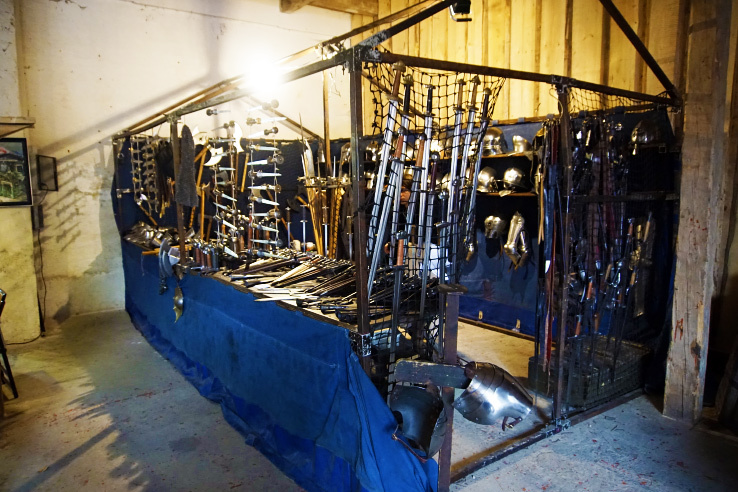 They had everything from fire performers, dancers, knights, steers, peasants, gypsies. Every second there was something to be seen. Not a dull moment at all! It lasted for about an hour and we videotaped and photographed the entire thing. In complete awe of what we were witnessing! After the parade ended, we continued with our shopping and festival wandering. We only had about an hour until it was time to head to the JOUST! So we picked up some snacks for the show (candied almonds, pumpkin seeds, and cashews, to be exact) and a fresh Radler and headed in!! 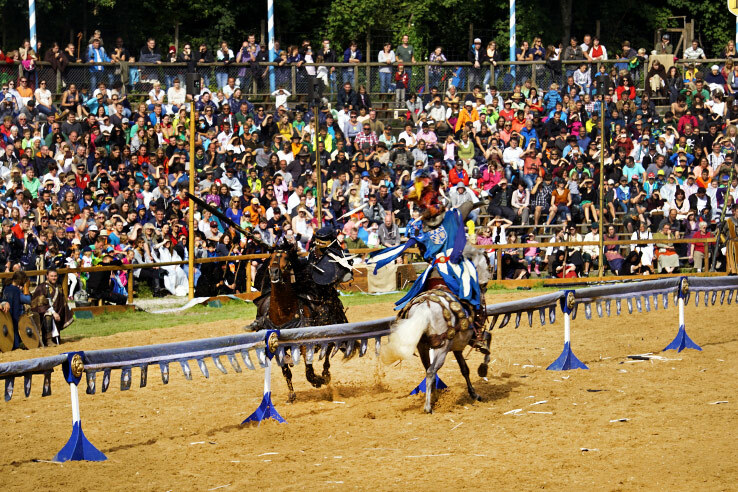 The Jousting Tournament to end ALL Jousting Tournaments. We had tickets in section A. 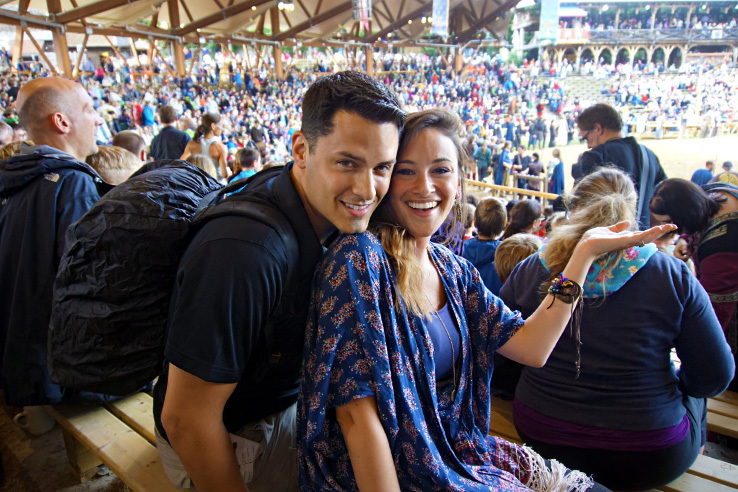 Both A & H are covered sections, so no matter what the weather is outside, you are guaranteed to enjoy the performance – in complete comfort. It only rained for a portion of the show, but we didn’t have to worry because of our seats, which was GOLDEN. For two people that never get to experience something like this, paying the extra money for a covered seat was more than worth it. We highly recommend you do the same! 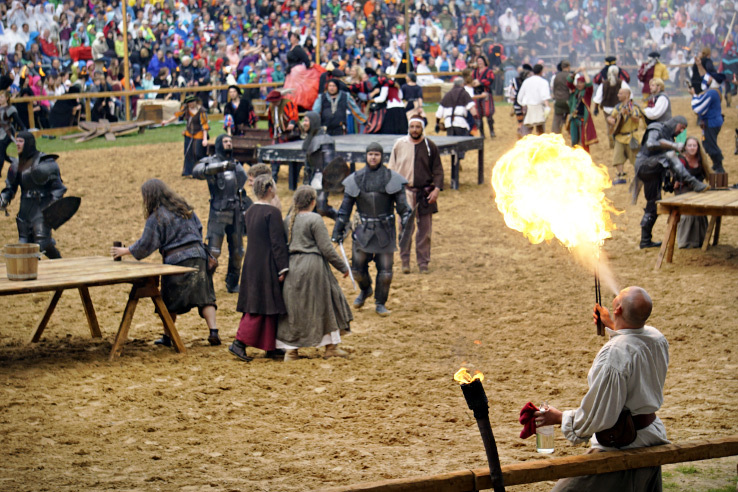 The tournament was so much more than just a show – it was an adventure! A narrator read the entire play, kind of like a storybook. 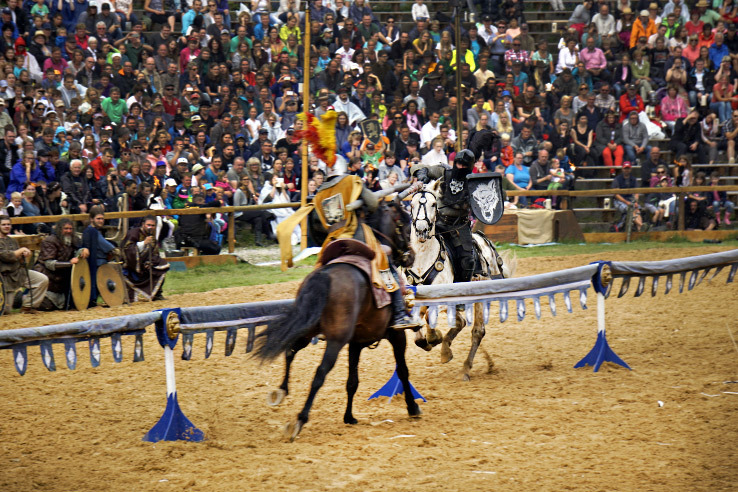 Of course, the jousting was the main event. That alone was a wonder to witness. 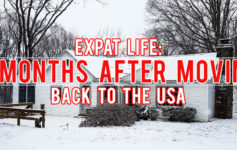 …But it did not end there! 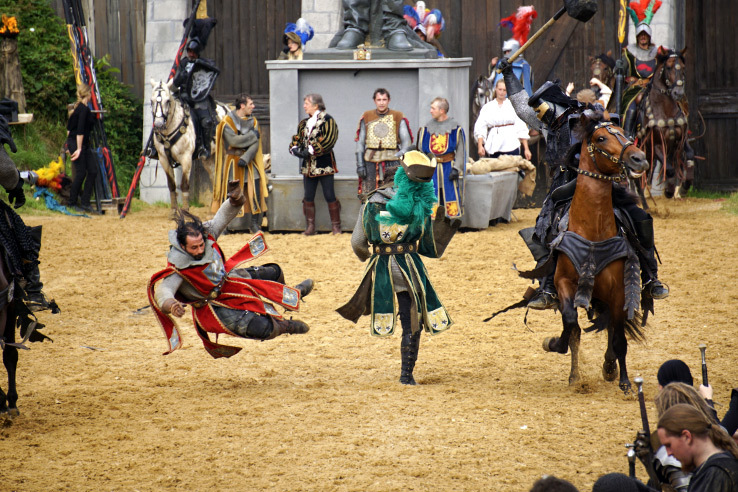 Battles, acrobatics, dancing, acting, moments of love, moments of war. We felt like we were watching a live movie. They had every type of performer too. 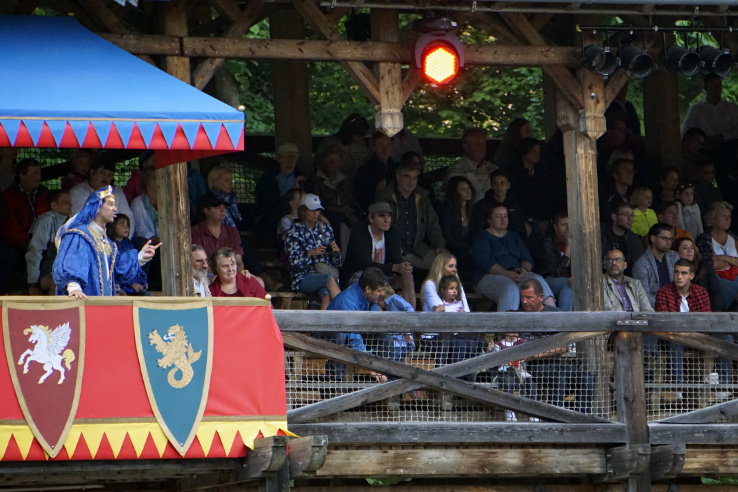 From knights to dancing horses and GEESE! There was even a group who did acrobatics on running horses. The show was all so action-packed. And even though we couldn’t understand everything they said (of course it was all in German), it didn’t even matter. The performers involved the audience, as each section gets a designated knight. We felt like kids again. There were even little German kids in front of us who kept looking back and smiling because we were yelling and screaming JUST as loud as they were. When the show ended, we couldn’t have been more satisfied. It was beyond anything we’ve seen before. 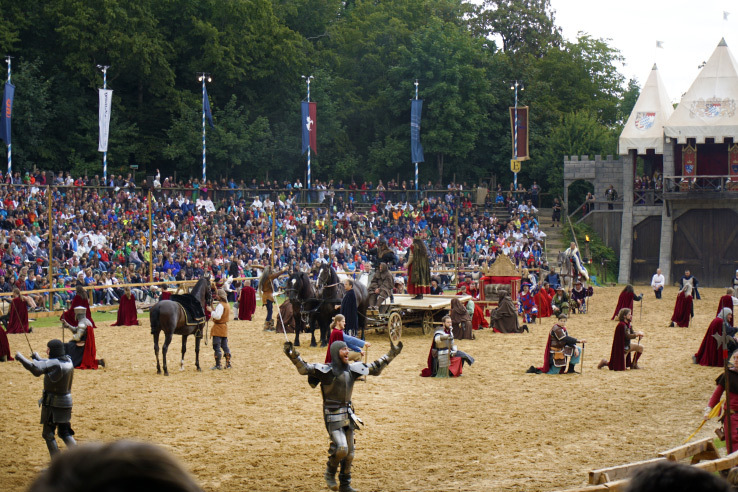 We had high expectations for the biggest jousting tournament in the WORLD and they were definitely met. After the joust, there’s the after party. After the show, there was still time to roam around the festival grounds. 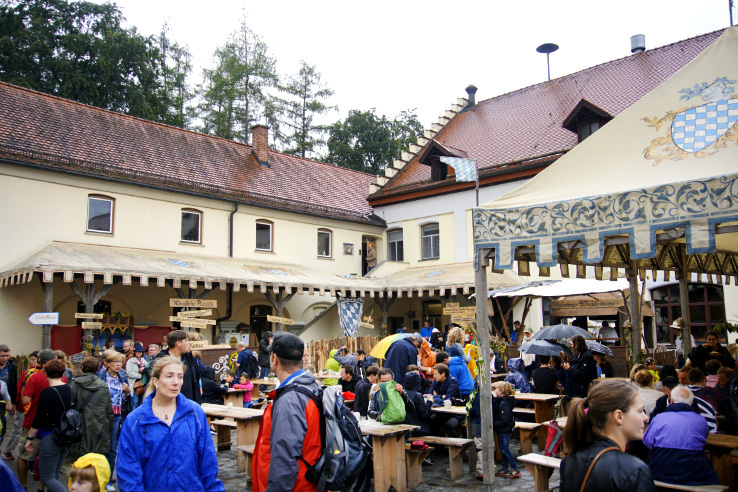 Then we went back into the castle’s Beer Garden (of course there’s a beer garden, this is Germany after all!) to enjoy some food and take in the scenery one last time. 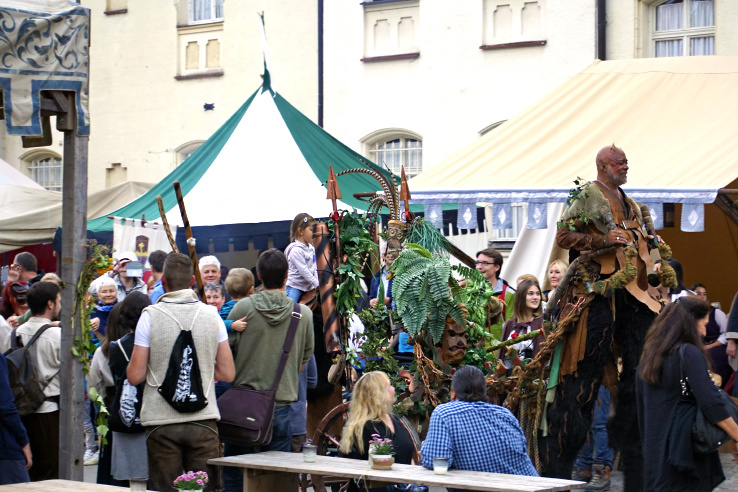 The faun was pulling a small carriage with a fairy dancer and mystical music. The kids were SO happy and adorable. Full disclosure: I really wanted to jump on that carriage but held myself back. Of course, it was only meant for the little ones…right?? What a DAY! A fantastic, medieval, imagination-filled day! 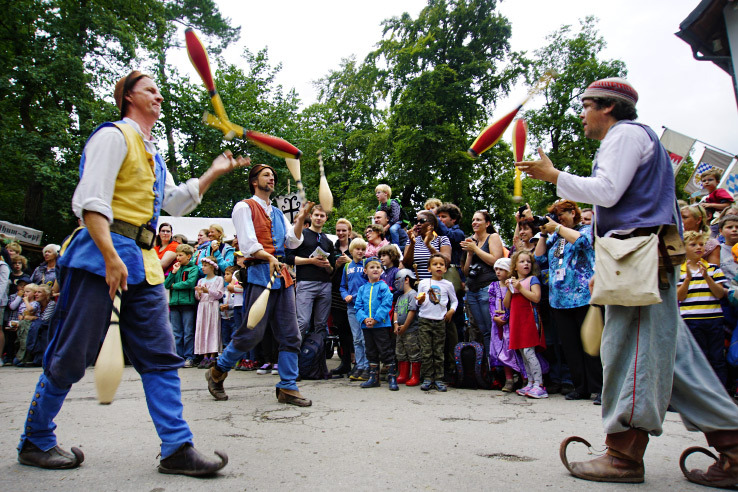 The Kaltenberger Ritterturnier takes place every year during 3 weekends in July, at Schloss Kalteberg – 25 miles outside Munich, Germany. Every weekend has 3 tournaments: Friday, Saturday and Sunday nights. Advanced booking saves you a few euros, and tickets range from 27 euros to 67 euros, depending on the festival experience you are looking to have. Parking costs 3.50 euros OR you can easily take the train to Geltendorf and hop on the shuttle to Kaltenberger. It comes every 15 minutes and only costs 1.90 euro per adult. 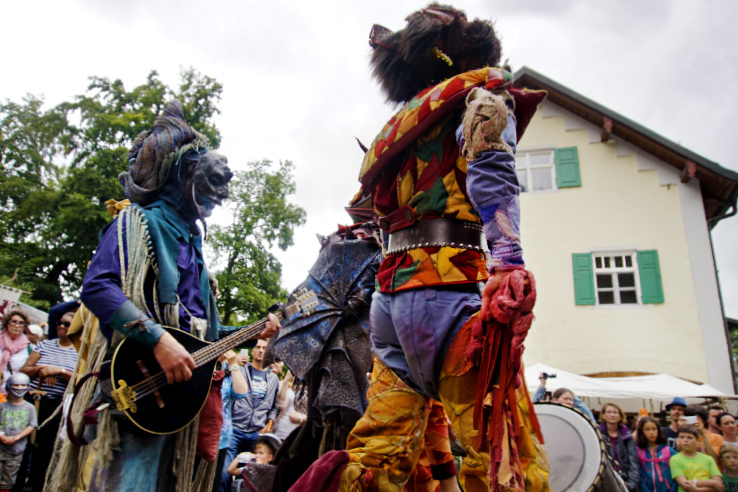 For more details of getting there and the schedule for this year, visit the Kaltenberger Ritterturnier website. Overall, we spent about 100 euros, in addition to our tickets. But that was us being frivolous and not holding ourselves back. In our opinion, holding back would have been a mistake. This was truly a once in a lifetime experience for us. We wanted to do, see and eat it ALL! And we totally did. 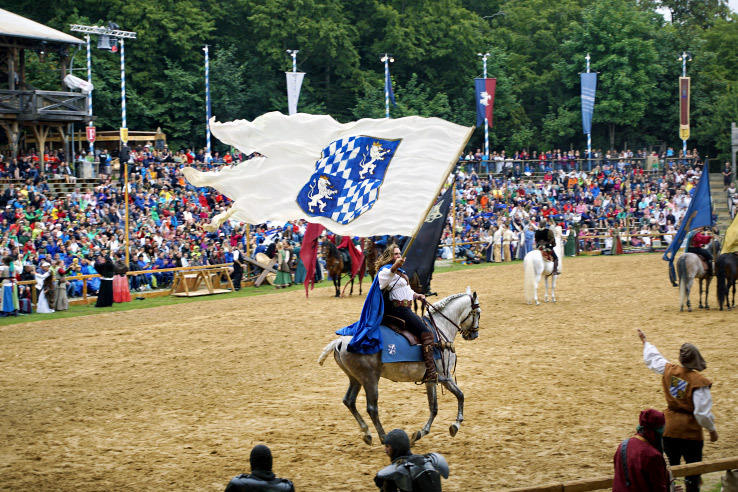 Is it time to get in touch with your inner knight, drink ale and watch the BEST jousting performance that’s ever graced this planet earth? YES, it definitely is! 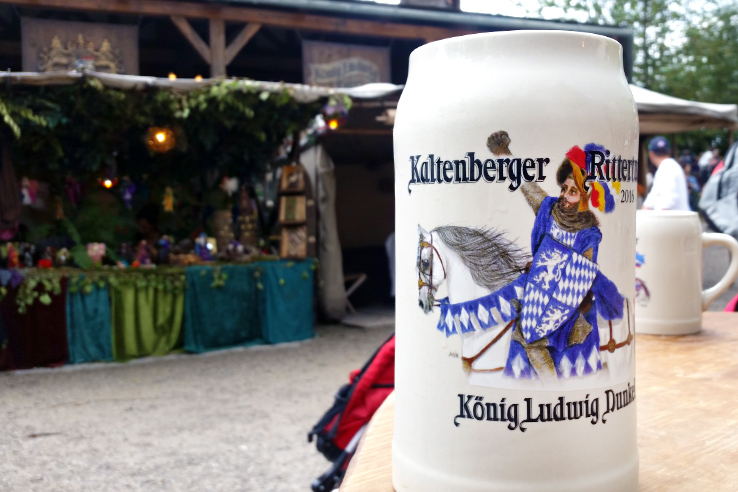 Watch our ENTIRE Day at Kaltenberger Ritterturnier through Snapchat!